To be honest, I'm not really fond of watches and clocks. I feel controlled and dominated by them, something I don't like at all. I don't need an alarm clock in the morning, I'm able to get out of bed on my own – very, very early, btw. I'm owning one old wrist watch, the first and only one I've ever had. And I'm not longing for another one. Although this old watch is very simple and not even waterproof it is still in working order. Maybe because I very rarely wear it ;-). With one exception. When I have to travel by plane I put it into my handbag since I once nearly missed a flight. I was sitting in the lounge at London Heathrow waiting for my flight back to Germany. They didn't announce any departures in that lounge, perhaps to not disturb the people reading or working. However, when I finally got the feeling I should move to the gate now and I asked somebody for the time, it nearly was too late. I had to run like mad – Heathrow is huge! 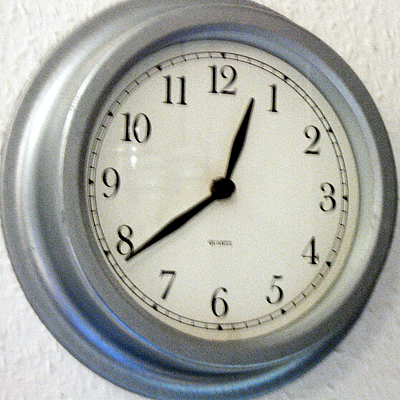 There is also a clock in my kitchen. Pasta and eggs need to be cooked precisely. But that's it. No decorative clocks anywhere in my home. Last week a friend of mine asked me to post on the internet some stuff she wanted to sell. I visited her and took some photos. Among crockery and coats there was an old wooden regulator clock. 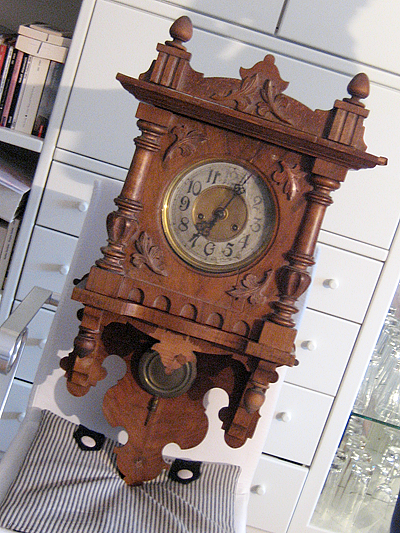 It really needs some restoration but seems to be of some value (I don't know anything about clocks and I may have dumped it). Back at home and tweaking the photos I realised that this old clock displayed in a fresh and modern setting can look absolutely beautiful. 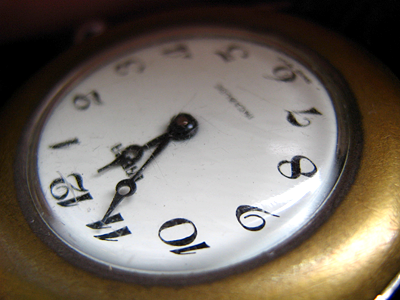 We used such a background for the clock's photo simply for colour contrast. I'm surprised. I had seen old clocks before, all cluttered in even more cluttered spaces. But with this new and fresh approach I would reconsider my distaste for clocks and watches. Maybe I should buy this old thingy?